Thank you for the nice words about my new ‘do’. I’m rather pleased with the second cut. I jinxed myself with the weather though, it’s been cold and wet (really cold) since I posted about ‘T-shirt weather’. I find winter very hard here, mostly because every time I drive in the car I feel helpless and just want to cry, I don’t think I’ll ever get used to the poverty and homelessness that is so visible, and contrasts so strongly with the extreme wealth that is around. I don’t talk much about these sorts of things because I don’t want people to think I’m criticizing. I know I’m very much a foreigner here, and that the country has made great strides in the last few years, but winter leaves me feeling like I should do more, I just don’t know what. Ok, on to other things. One of the good things to come out of the whole guild trauma is that I’ve made a couple of lovely friends. One of them, F, is fabulous. 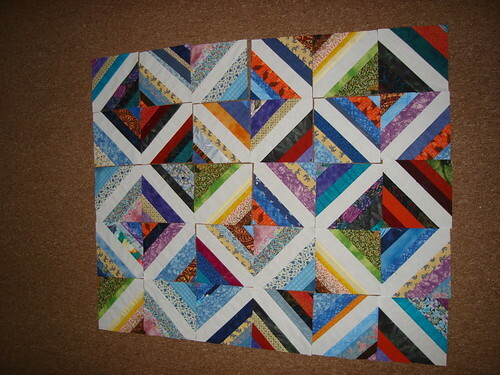 She is a prolific quilter and does the most amazing things with scraps, I mean tiny scraps! Last week I visited her for a sewing day – I love sewing at her place, she lives in an apartment overlooking the ocean and it’s so peaceful. Anyway, F had told me that she had been sewing together some blocks for me as her leaders and enders. 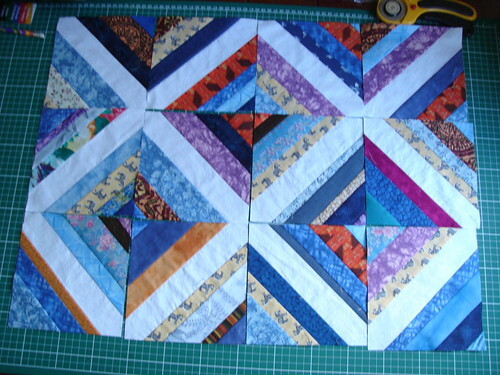 She started with the centre squares at 1 inch cut, none of the strips are wider than one and a quarter inches!! I was floored. They are just stunning and all from fabric that most people would place in the rubbish bin as being too small to work with. I’m going to be setting them square in a square with a plain white fabric then I’ll lay them out and see what’s next. Aren’t they awesome?! F also dropped off some quilts today for the quiltathon (yes we have completed quilts before the day – they do things very differently here) I’ll take some pictures outside when the weather is better. 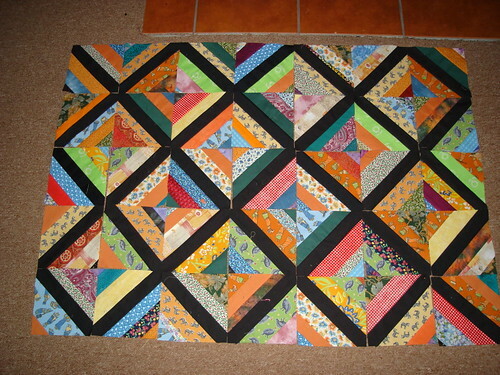 Again, they are scrap quilts with centres made of tiny, tiny pieces. Well I’ve got half an hour before I have to go back to work. Hopefully the kidlet will stay asleep long enough for me to peruse a few more blogs. 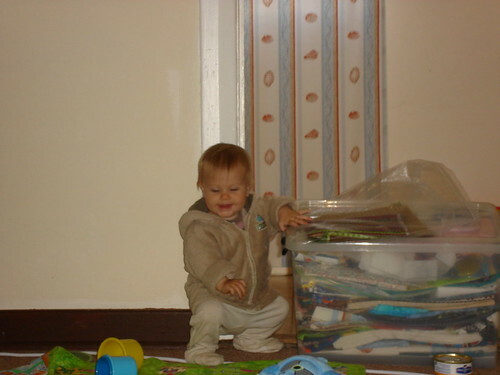 Can someone please tell me where time has gone? Gorgeous Girl standing on her own two feet long enough for me to take her picture! What, do I hear you ask, was the great treasure which brought Gorgeous Girl to her feet? Milestone 2: This post also marks 300 posts on this little blog. I can’t believe I’ve had that much to say (you can all stop laughing now). Thank you to all of you for coming on this little journey with me, both commenters and lurkers. I’ve had a great time so far, hopefully I’ll stay interesting for at least another 300 posts. I had my haircut on Monday. I went to the usual salon, but not my usual guy. He didn’t blow dry my hair, which is ok by me because then I get to see what it will look like in my normal life, and when I left the salon I was ok with it, but by the time I got home and it was dry…well let’s just say I was less than impressed. It made me feel very middle-aged. So I did something most unlike me instead of complaining to Gorgeous Man about it for the next 10 days little while, I rang my regular stylist and explained the situation to him. He very kindly arranged for me to come in at a time when the first stylist wouldn’t be there (I didn’t want to hurt his feelings) and recut it. It’s not the look I was after, but I can live with it, and have decided to embrace the curl. and it’s rare for me to like a photo of myself. Gorgeous Girl is wearing a shirt that I appliqued the flower on. The fabric for that came from a bag of scraps from my next door neighbour just before we moved here. It is truly vintage. Her father owned a fabric store way back when – she is now retired – and some of the fabric still has the shillings and pence price tags stapled to it. I’ve got lots of plans for that fabric – now to just find some time! 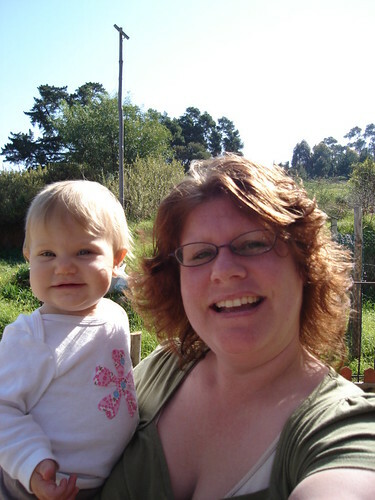 Milestone 3: Today was the first day in many months that it’s been warm enough to wear a T-shirt! Bring on spring!! My ‘helper’ has decided that she wants to type too, so blogging time is over. Craftiness again soon. Have a great day, and thanks for stopping by. So instead of typing a nice blog post last night showing you the results of my weekend of sewing like a mad woman, Gorgeous Man and I played pass the screaming baby. She was like I’ve never seen her before, and it took nearly 2 1/2 hours to settle her down. I know we are very spoiled and a lot of babies are like that all the time, but WOW. 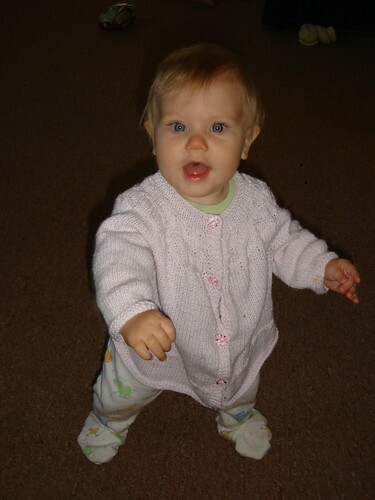 Finally worked out that she must be teething, and once she had the teething ring she calmed down quite a lot. 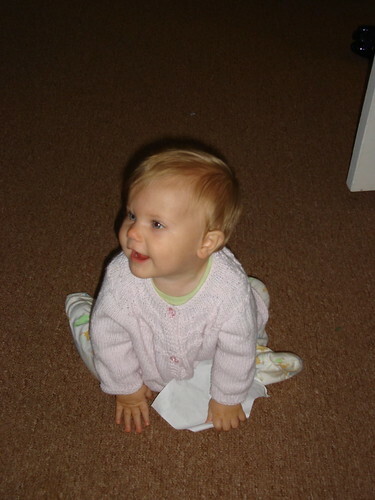 This morning she has been back to her usual happy self, which is a huge relief! polycotton, local quilting fabric that everyone used before the US imports became available, furnishing fabric, sheeting, good quality quilting fabric and so the list goes on. Because I am cheap frugal, I also unpicked the trimmings from the white blocks to add to the black ones. I’ve still got more of the black to trim down. I’ll be taking the extra white strips to the next guild meeting to see if I can get a few more ladies to sew some blocks before the day. I’ll spend next weekend sewing too and then take whatever is left over to the guild meeting and hand that out too. September 15 is the big day of the quiltathon and then my association with the guild will end for the year. I had to go to the committee meeting (even though I have resigned) because I said I’d finish the quiltathon off. Well that was interesting. They all had their printed agenda’s that had be sent out 6 days before the meeting. 🙂 The meeting confirmed my desire to leave the committee. There are some very nice ladies on it, but one of them was particularly hostile. 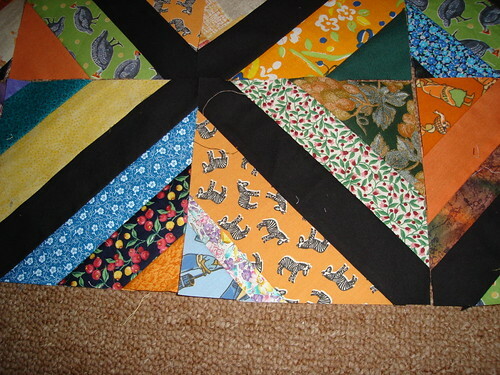 OK, enough ranting about that…The quilt blocks are pretty. Baby barrier to stop the child going into the entry way (that we never use) and playing with the cat food/litter. A while ago I showed some pictures of our helper wearing Gorgeous Girl, and Starfish (sorry, no link – password protected) asked how on earth she put Gorgeous Girl onto her back. Well, since I haven’t done a lick of crafting this week, what with the Sunday shift at work and doctors appointments etc I thought I’d show you how it’s done. 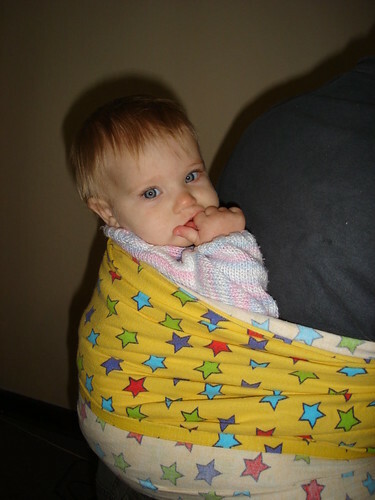 First put blanket and baby onto your back. lean forward and put the blanket over the baby and tie a knot. Fold up the bottom of the blanket and tie another knot. I haven’t tried this yet, I’m too scared that the knots will come undone! 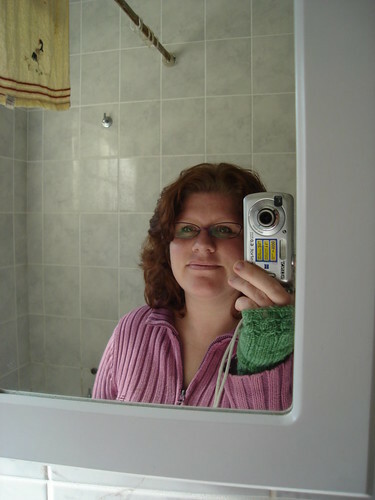 Today is Wednesday, which means it is knitting for me day. I’m off to knit on my second sock for a few minutes before I have to start work again. The good news is that I don’t do the 7 – 9 pm shift on a Wednesday so I’m hoping to get the sashing attached to Gorgeous Girls quilt tonight. Pictures of that in the next post with any luck. I’ve also managed to trim a few more string blocks which were donated at the guild meeting on Monday. When I’ve trimmed all of them I’ll lay it out and take a picture. Thanks for all of your comments about my guild situation. Seems to be a common problem with guilds. I thought very hard about my course of action and have decided to resign from the committee and take a break from the guild. I’ll try again in the new year when there is a new committee in place. Most of the women there are lovely, and having the guild to look forward to each month has been good – especially when I have been feeling a little lonely or homesick. I was going to resign from the guild effective immediately, but I decided to see the quiltathon through. It was my idea, and I feel some obligation to it. Besides, I know that it will probably die away if the two of us on the committee that were the strongest force behind it aren’t there. The first colour is more accurate. These were really fun to do and I’ve just been gifted with a whole stack of muslin so I’ll be doing some for me in the near future. Probably with strips all the same width though. 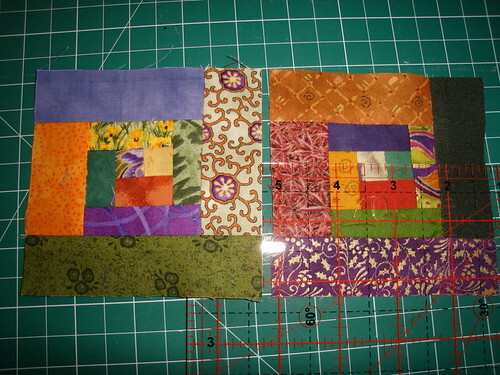 These blocks were a mix of my own and donated fabrics. I’ve also made some more straight strip blocks, and packaged colour-coordinated kits for the day, and put together some 1 and 1/2 inch strips into sets that the ladies can take home and then bring back on the day. 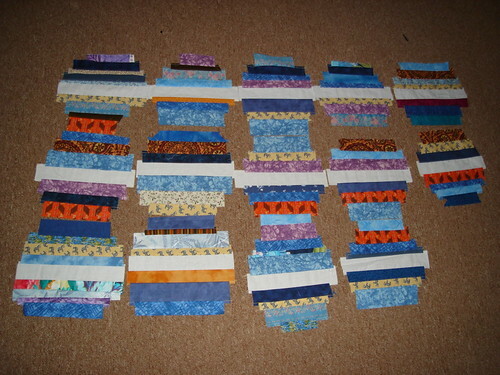 The idea is then that all the blocks will be put together and randomly sewn into a quilt top. 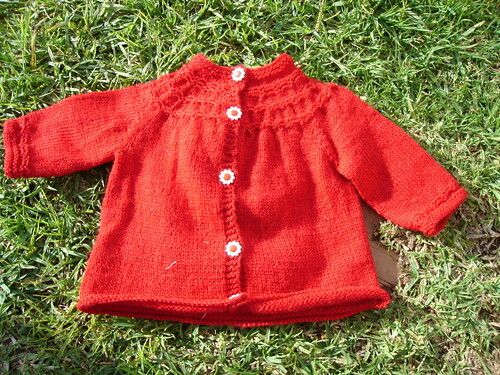 I sewed the buttons onto the charity sweater today. I’m really pleased with how it turned out. I am sadly behind in my committment to 25 things for Charity this year. Well it’s late and I’m tired so I will leave you with this picture of Gorgeous Girl. 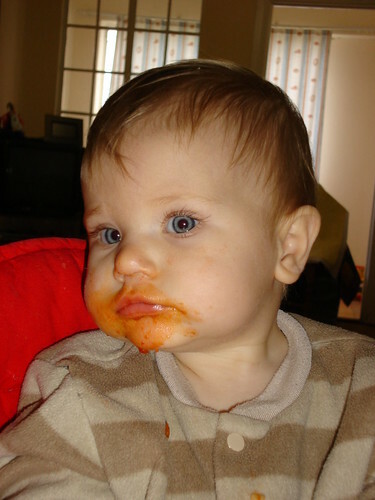 She loves feeding herself pasta. 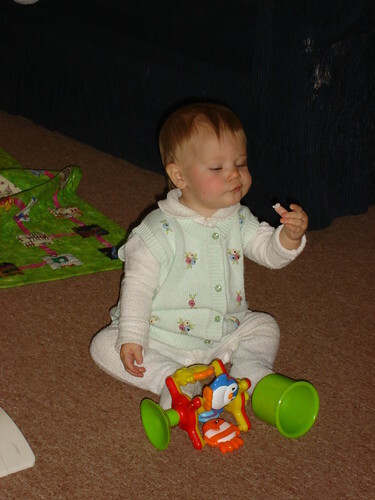 And, simply because she is so darned cute – here is Gorgeous Girl caught in the act of eating paper again. 27. In Her Hands – Craftswomen Changing the world – Paola Gianturco and Toby Tuttle – this was interesting. It looked at women in the developing world who were earning a living through their craft, and in the process raising the status of women and achieving education for their children. I haven’t forgotten about the pictures of how to wear your baby African style, I just wanted to show some crafty stuff today.